Last weekend a friend mentioned he's been going to EVO Rock climbing gym in Concord on Wednesday. It is friend's night and I could try it out for free. Hmmm, I've always had a curiosity in climbing. There were two problems though. I'm an upper body weakling, and I'm deathly afraid of heights. Local midweek skiing is a bust right now, so I thought what the heck, let's try it! First reaction entering the climbing gym was no f'n way am I going up that high! The walls were huge. There were numerous routes and areas, so the 40-50 people that were there were spread out all over. Steve gave me instruction how to tie my knot. He belayed for me. I'll get instruction next time to belay. I started on a 5.6 route. It took a long time, my forearms started to get noodly. I cleaned it though. At the top, I could not let go! Every instinct in my body said death surely awaits as soon as I come off that wall. You only look up when climbing, but when you reach the top, you take your first real look down. Holy freak out. Of course, Steve was cracking up. Eventually fatigue dictated I let go and let Steve belay me down. I was trembling just a little. I tackled an auto-belay 5.4 climb next, which went pretty smoothly too. Still probably took me three minutes, while the others could do it in 20-30 seconds. Trusting the auto-belay again took a monumental leap of faith, as you have to free-fall a bit before the centrifugal clutch kicks in and arrests your fall. I moved to a 5.7 climb next. This one stumped me right at the top and fatigue forced me to come off. Studying from the bottom, I saw there were a couple holds I missed that could have helped. I successfully climb two other 5.7 routes after that. At the end of the evening, I stepped up to a 5.8 route. This one reaches a ledge where you can rest for a moment, but then to continue, you have to make a dynamic move out onto an overhang about three stories up. That freaked me out the most. Why would you jump out into nothingness? Still had weak faith in that rope. I grabbed the hold and was able to finish that climb. My arms and shoulders were completely destroyed from just six climbs. I shudder to think how I'll feel when I get up in the morning. Sure was stimulating fun though. I was forced to contort my body in all manner of ways it hasn't move in years. Doing this regularly would have to do a body good. I hope to hike all of Colorado's 14ers someday. A few of those provide significant exposure. I just may have to go back to EVO for some more. At the very least, it could take the nervous edge off planned hikes and let me become more familiar with what I'm capable of. This winter is starting to look a lot like temperamental last winter. Bipolar temperature swings, rain and snow, unpredictable conditions for just about any outdoor activity. The White Mountains have been holding onto a decent snow base though, keeping the Nordic ski season alive for now. It would be nice to have reliable local snow for midweek skis, but I'll settle for weekend-only skis if conditions are good. 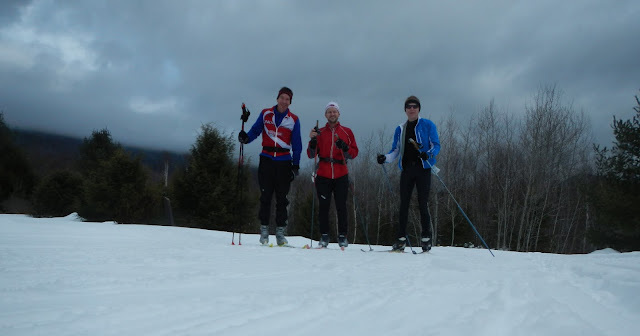 Keith, Skogs and myself at Waterville on January 21. Wet sticky snow, but good cover and still hammered out 40km in less than 3hrs. What about riding? I avoid road as much as possible these days. Just can't stomach the risk anymore. Local trails alternate between too much snow, ice, mud and then back to snow. Seems like there is never a stable situation where any of the bikes I have will be fun. When the Cape got hammered with more than a foot of snow recently, I thought wonderful, now one of the last resort riding places in New England will be off-line for the rest of the season. But then it got crazy warm and the snow was gone in a few days. When faced with having to get in the car to ride somewhere and given the choice between riding dirt or snow, dirt wins every time. It is so much more fun to ski snow than ride it. Sure, there are those rare days, maybe only a couple times a winter, where you get white asphalt trail conditions. And there are days where only a fat bike makes sense. That is why I built one up. But too often, winter riding is a luge run of ice or slog fest of slush or powder. On average, I typically go twice as far in the same time with skis on snow than with bike on snow. Isn't fast more fun? Plus I like the workout skiing provides. It is weight bearing and uses all the major muscle groups. The rhythmic movement puts you into a deeper flow state too. More intense endorphin buzz. This weekend I could drive 90 minutes north and ski on good cover or drive 75 minutes south and ride dry singletrack. Best of both worlds, right? I thought about taking the fat bike up to the Whites and hitting a snowmobile loop, but temps suggested mashed potato conditions were likely. Instead, I hit Duxbury trails just south of Boston and conditions were mint! It is this diversity that makes living in New England such a blessing. Riding out to Saquish and heading back to Gurnet Light at low tide, January 22. No Duxbury ride is complete without a beach cruise. Looking north along the long sandbar. Solid one hour time-trial effort can be had by riding out to Saquish and back. Open fresh water, bone dry trails in January. 40 miles in 3.3hrs. More please. Of course, conditions are always great for hiking. I feel bad I didn't hike this weekend. Next weekend is an off-Friday weekend for me, so I'll have to hike double on one of the days. What can you actually do in 0.3 seconds? I don't have to feel intimidated changing in front of the poster anymore. The coming week looks even murkier for local midweek activities. There will be no snow to ski and trails will be a mess for riding. With any luck, maybe the weekend will come through with best of both worlds again.